Leila Tov-Ruach, "Jealousy, Attention, and Loss," pp. 465-488. UC Press would like to clarify that "Leila Tov-Ruach" is a pseudonym used by the editor of the volume, Amélie Oksenberg Rorty. 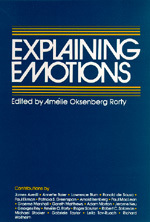 The challenge of explaining the emotions has engaged the attention of the best minds in philosophy and science throughout history. Part of the fascination has been that the emotions resist classification. As adequate account therefore requires receptivity to knowledge from a variety of sources. The philosopher must inform himself of the relevant empirical investigation to arrive at a definition, and the scientist cannot afford to be naive about the assumptions built into his conceptual apparatus. The contributors to this volume have approached the problem of characterizing and classifying emotions from the perspectives of neurophysiology, psychology, and social psychology as well as that of philosophical psychology. They discuss the difficulties that arise in classifying the emotions, assessing their appropriateness and rationality, and determining their function in motivating moral action.